Ida was the tour guide on my two-day visit to Havana. Friendly, knowledgeable and fluent in English, Ida made it clear right off the bat that there were two topics she wasn’t allowed to talk about in depth: politics and religion. Which kind of dampened my enthusiasm, because those were two of the subjects I was most interested in. I’d have to be content to take photographs and then learn more when I returned to the USA, where—unlike Cuba–the internet was pretty much always at my fingertips. When Christopher Columbus landed in Cuba on his first voyage of discovery in 1492, he found indigenous peoples and their Amerindian religions already there. By the early 1500s’, that native population had been largely decimated by the Spanish conquerors, who brought their Catholic faith—along with the white man’s weapons and diseases–to the Caribbean with them. The Spanish soon began importing slaves from western Africa to work the sugar cane plantations that crisscrossed Cuba. That’s why, five centuries later, there are still strong reminders of Catholicism and African religions throughout Cuba. Though raised Catholic, Fidel Castro rejected his faith during the 1959 Revolution. Priests were deported, sent to work camps or killed. Christians were discriminated against and banned from joining the Communist Party. Most Cubans didn’t dare attend worship services. Atheism became the order of the day. With the collapse of the Soviet Union in 1990 and the resultant economic depression in Cuba, the church experienced a resurgence. But government officials continued to harass and intimidate pastors and their congregants. That stance softened a bit as the twenty-first century approached. Fidel “reinstated” Christmas following Pope John Paul II’s visit to Cuba in 1998. After Pope Benedict visited the island in 2012, Good Friday services were once again allowed. The government now recognizes freedom of religion but often refuses permission for church buildings or other religious structures to be built, forcing worshippers to meet in private homes. More than half the current population of Cuba was born after the Communist Revolution. Though 60 percent of Cubans “identify” as Catholic and five percent as Protestant, most people do not regularly practice any religion. But the faithful take hope in the fact that beautiful, though often dilapidated, cathedrals still stand in Cuba. 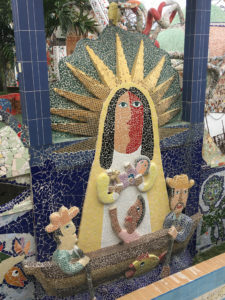 Religious statues and other artwork can be found in most every city and town. Some Cuban citizens openly wear cross necklaces. Churches are allowed to provide food and social services that were once strictly limited to the government. It’s a far from our American definition of religious freedom. But it’s a start. Next week, I’ll write about what I learned about Cuban politics. But not from Ida.